Although fiber optic cable is still more expensive than other types of cable, it's favored for today's high-speed data communications because it eliminates the problems of twisted-pair cable, such as near-end crosstalk (NEXT), electromagnetic interference (EIVII), and security breaches. There are three types of fiber optic cable: single mode, multimode and plastic optical fiber (POF). Multimode cable is made of multiple strands of glass fibers, with a combined diameter in the 50-to-100 micron range. Each fiber in a multimode cable is capable of carrying a different signal independent from those on the other fibers in the cable bundle. POF is a newer plastic-based cable which promises performance similar to single mode cable, but at a lower cost. While fiber optic cable itself is cheaper than an equivalent length of copper cable, fiber optic cable connectors and the equipment needed to install them are more expensive than their copper counterparts. Fiber optic cable functions as a "light guide," guiding the light introduced at one end of the cable through to the other end. The light source can either be a light-emitting diode (LED)) or a laser. The light stays confined to the core because the cladding has a lower refractive indexa measure of its ability to bend light. Refinements in optical fibers, along with the development of new lasers and diodes, may one day allow commercial fiber-optic networks to carry trillions of bits of data per second. With tight-buffered cable designs, the buffering material is in direct contat with the fiber. This design is suited for "jumper cables" which connect outside plant cables to terminal equipment, and also for linking various devices in a premises network. Over the past few years, fiber optic cable has become more affordable. It's now used for dozens of applications that require complete immunity to electrical interference. Fiber is ideal for high data-rate systems such as FDDI, multimedia, ATM, or any other network that requires the transfer of large, time-consuming data files. • Greater distance-You can run fiber as far as several kilometers. • Low attenuation-The light signals meet little resistance, so data can travel farther. • Security-Taps in fiber optic cable are easy to detect. If tapped, the cable leaks light, causing the entire system to fail. • Greater bandwidth-Fiber can carry more data than copper. • Immunity-Fiber optics are immune to interference. Single-mode fiber gives you a higher transmission rate and up to 50 times more distance than multimode, but it also costs more. Single-mode fiber has a much smaller core than multimode fiber-typically 5 to 10 microns. Only a single lightwave can be transmitted at a given time. The small core and single lightwave virtually eliminate any distortion that could result from overlapping light pulses, providing the least signal attenuation and the highest transmission speeds of any fiber cable type. Multimode fiber gives you high bandwidth at high speeds over long distances. Lightwaves are dispersed into numerous paths, or modes, as they travel through the cable's core. Typical multimode fiber core diameters are 50, 62.5, and 100 micrometers. However, in long cable runs (greater than 3000 feet [914.4 ml), multiple paths of light can cause signal distortion at the receiving end, resulting in an unclear and incomplete data transmission. Testing and certifying fiber optic cable. • Attenuation (or decibel loss)-Measured in dB/km, this is the decrease of signal strength as it travels through the fiber optic cable. • Return loss-The amount of light reflected from the far end of the cable back to the source. The lower the number, the better. For example, a reading of -60 dB is better than -20 dB. • Propagation delay-This is the time it takes a signal to travel from one point to another over a transmission channel. • Time-domain reflectometry (TDR)-Transmits high-frequency pulses onto a cable so you can examine the reflections along the cable and isolate faults. There are many fiber optic testers on the market today. Basic fiber optic testers function by shining a light down one end of the cable. At the other end, there's a receiver calibrated to the strength of the light source. With this test, you can measure how much light is going to the other end of the cable. Generally, these testers give you the results in decibels (dB) lost, which you then compare to the loss budget. If the measured loss is less than the number calculated by your loss budget, your installation is good. Newer fiber optic testers have a broad range of capabilities. They can test both 850- and 1300-nm signals at the same time and can even check your Gable for compliance with specific standards. When to choose fiber optic. Fiber optic cable consists of a core, cladding, coating, strengthening fibers, and cable jacket (see above). Core -This is the physical medium that transports optical data signals from an attached light source to a receiving device. 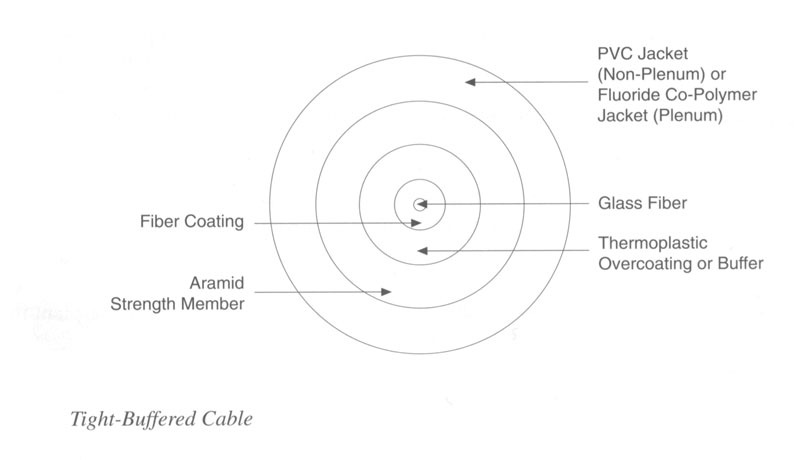 The core is a single continuous strand of glass or plastic that's measured (in microns) by the size of its outer diameter. The larger the core, the more light the cable can carry. All fiber optic cable is sized according to its core diameter. The three sizes most commonly available are 50-, 62.5-, and 1 00-micron Gable. Cladding -This is a thin layer that surrounds the fiber core and serves as a boundary that contains the light waves and causes the refraction, enabling data to travel throughout the length of the fiber segment. Coating -This is a layer of plastic that surrounds the core and cladding to reinforce the fiber core, help absorb shocks, and provide extra protection against excessive cable bends. These buffer coatings are measured in microns (p) and can range from 250 p to 900 p.
Strengthening fibers -These components help protect the core against crushing forces and excessive tension during installation. The materials can range from Kevlat4 to wire strands to gel-filled sleeves. Cable jacket -This is the outer layer of any cable. Most fiber optic cables have an orange jacket, although some may be black or yellow.